wedding, a night at the opera, or a day at Royal Ascot! The purse is knitted entirely in the round in one piece. You will need a 40cm/16″ 4mm/US6 circular needle and DPNs. A length of i-cord forms the drawstring fastening through the ribbed neck of the bag. While the bag itself is knitted seamlessly some sewing skills are required for making the lining. 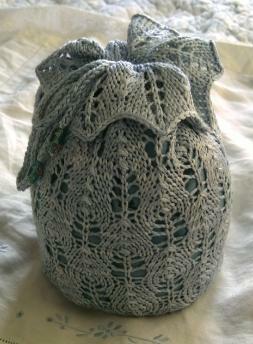 The pattern includes full written knitting instructions, a lace chart, and instructions for blocking and lining the bag. Approximately 50g of a DK weight silk yarn. One fat quarter (45 x 55cm/18″ x 22″) of a medium-weight fabric (e.g. slub silk) for lining. A small piece of plastic canvas to reinforce the base. Some beads (optional) for decoration.